I was born on May 10, 1986 to my parents, Mark and Sally Scarborough. What a lot of people don’t know about me is that I am an only child. 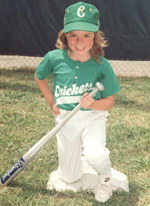 Getting involved in softball all started when I turned 5, my Dad and I went to Oaks Dad’s Club Little League field in Houston and signed me up to play softball. Little did I know this would be the beginning of the end! The first team I ever played for at Oak’s Dad’s Club was called the Crickets (what a great name my first team!). Once I began playing softball, I can remember that almost every birthday and Christmas present I received was softball related and was either a bat, glove or a new pair of cleats. I started taking pitching lessons when I was 8 because my league team at Oaks Dad’s Club team needed a pitcher so my dad volunteered me. Once again…another life changing decision. In addition to taking pitching lessons, I also began taking hitting lessons. Even though I lived in Houston, I would travel to Pearland for my lessons (with traffic this was 45 min-an hour + drive). I knew right away that I loved the game and I worked really hard both at lessons and at practice to become better. Softball did not necessarily come easy to me, like it may to some. I quickly learned that I was going to be someone who would have to put in the hours to practice if I wanted to have success at the sport. I began logging many miles, spending alot of time with my mom in the car doing homework and talking about life. I would eventually travel weekly as I pursued my love for the game driving to and from practice and games, driving all over the city of Houston. I joined my first travel ball team when I turned 9 I decided to play select ball and joined 12U Team Texas. I was the youngest person on the team, and I will be the first to tell you that I was the least talented. At one point, a parent came up to my mom and told her that I would never make it as a pitcher and I should probably just stop. Guess I eventually proved her wrong…..
After playing with Team Texas for over a year, I changed teams and began playing for Texas Express out of Spring, Texas. I played on this 12U team until 14U at which time we formed the first ever Hit Away team, a team that played together through my first year of 16U. Then I played for Impact Gold my sophomore year in high school thru the beginning of my junior year. I finished out my high school select team career playing for Texas Storm Gold. Some of my best memories are of the many travel adventures I had while playing on these select teams. I learned alot and gained much knowledge not only from the coaches of these teams but all my teammates as well. You realize not only your love for the sport, but the strength of your dedication as you play up to 6 games a day in a 100 degree heat. During this time at the age of 14, the summer before my freshman year in high school, my parents and I moved from Houston to the small town of Magnolia, nestled between Tomball and The Woodlands, north of Houston. At this time I was also playing volleyball, but decided after my freshman year to no longer participate in that sport so I could focus on and dedicate my time and effort to softball. I had decided it was the sport I loved the most, and I set my goal of working hard on both pitching and hitting in an effort to earn a college scholarship to a D1 school. I was fortunate enough to make the varsity team my freshman year at Magnolia High School and was named the 18-4A Newcomer of the Year in 2001. While playing for Magnolia High, I was named 16-5A Most Valuable Player in 2003 and 2004, All Greater-Houston 1st team in 2002 and 2003, The Houston Chronicle All Greater-Houston Player of the Year in 2004, TGCA All State in 2003 and 2004, and NFCA High School All-American First Team in 2003. Just like I had to work hard at softball to see some success on the field, school was no different. I was always the type of student who HAD to study in order to do well in school and get good grades. Going to school and trying my hardest to have perfect attendance was always stressed to me as something of importance. When it came time to graduate in May of 2004, I graduated #9 in my class of 520 students. It was during my sophomore year in high school that I started to get noticed by college coaches due to my high school achievements and my success at tournaments with my 16U & 18U travel teams. Even though I was being recruited by both the SEC conference and the Big 10, the only conference I was hoping to gain the attention of was the Big 12 as I had my heart set on playing for Texas A&M. In November of my junior year, my dream finally became my reality as I verbally committed to play softball for Texas A&M and become an Aggie, WHOOP! To this day, I know it was the one of the best decisions I have ever made. 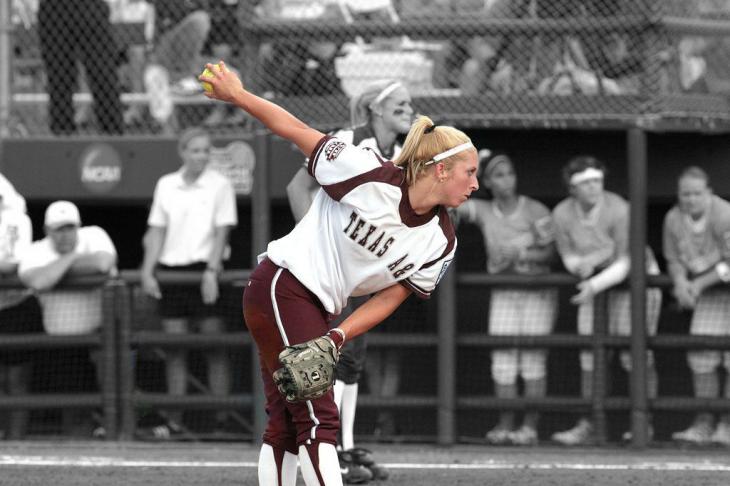 I played softball for Texas A&M from 2004-2008. My freshman year I got the call to start on the mound in the first game of the season in 2005 against University of North Texas. It was my first collegiate game to not only play, but to pitch, and I ended up pitching a complete game no hitter. What a moment for my first time out in the circle wearing a Texas A&M uniform. We had a very strong team in 2005 and had high hopes of going to the Women’s College World Series in Oklahoma City after winning the Big XII Regular Season Championship. However, in the last weeks of the season we were struck with major injuries to two of our starters, one of which was myself. Our leadoff hitter and speedster, Sharonda McDonald, tore her ACL in our last regular season series against Missouri in the last week of April. Then on May 9, 2005, the day before we were to leave for the Big XIITournament in Oklahoma City, while playing 1st base during practice I was hit on the right side of my head by a line drive, causing not only a skull fracture but causing my brain to bleed. 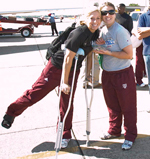 This injury caused me to be hospitalized, so I missed playing in both the 2005 Big XII Tournament and NCAA Regionals, too. After Regionals I received a medical release allowing me to play in our Super Regionals Series in the end of May against Alabama under one condition: I had to wear a helmet on the mound while pitching. I did whatever it would take in order for me to get back on the mound, even if it meant wearing a helmet and pitching at the same time, which believe me at first was very embarrassing, but I so badly wanted to be out there playing! Unfortunately, our post season run was cut short as we lost against Alabama, 2 wins away from going to the WCWS. I finished the 2005 season as a First Team All American, posting a .70 ERA, the best in my career. I also had a batting average of .410 that year with 43 RBI’s, 11 home runs and a slugging percentage of .719. In conference, I was named 2005 Big XII Freshman of the Year and Big 12 Player of the Year, being the first and only Big 12 Player to ever accomplish this feat. To be completely honest, at the time of receiving All American, Big 12 Player of the Year and Big 12 Freshman of the year, I didn’t really understand the magnitude of this feat. Looking back on it now, I am truly amazed. 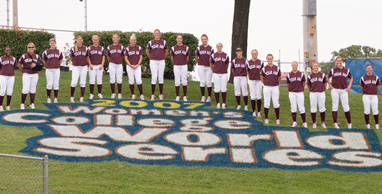 During my junior year in 2007, Texas A&M made its first appearance in the WCWS in over 20 years. It was an incredible experience playing at the WCWS, even though our team went 2 and out. We lost our first game playing Tennessee, facing Monica Abbott, USA National Player of the Year on the mound. Following that loss to Tennessee, our 2nd loss came to Baylor. Losing those two games made us even more determined to get back to Oklahoma City the following year, play better and stay longer. In 2007, I was again named an NFCA first team All American and shared the honor of Big XII Co-Pitcher of the Year with Oklahoma’s Lauren Eckerman. My senior year, 2007-2008, was one to be remembered for so many different reasons. It had both my best highs and worse lows of my career. I started off my senior season in the best shape I had ever been in. Through the first games 13 games I was on pace to hit the best I had hit in my entire career, although my pitching at the beginning of the season was struggling a bit. It was in February of 2008 in a game against Stephen F. Austin University that my life got thrown a loop. In one of my at bats in the second game of a double header, I went to bunt for a hit and when I went to push off to run to first base, I felt a very sharp pain in my right foot. The pain was so bad that I could even finish that at bat and I was out for the rest of that night. At first, it seemed it was somewhat minor injury, just thinking I had a mid foot sprain. The doctors thought I would be back on the field in a matter of weeks. Unfortunately, March came with no sign of the injury healing, in fact, the pain had gotten worse. I then went to a well know orthopedic surgeon in Houston, who after reviewing my X-rays, gave me the devastating news that the injury was a career ending injury called a Lisfranc fracture and would require immediate surgery to repair. This injury is very serious and extremely rare. In the same doctor’s visit that I found out this news about my right foot injury, I then asked the doctor to exam my left foot, too, while I was there as I had experienced pain in that foot for several years since high school. After carefully examining this foot, he looked up at me and told me that this foot would require surgery, too. He explained that my left big toe had detached from my foot; overtime the ligaments connecting the ball of my foot and toe had all torn. This would require a reconstruction of my left big toe and the ball of my foot would require reconstruction as well. In addition, my arch had collapsed under the pressure and weight of my body and needed reconstruction also. He then mentioned that I would probably never pitch again and may not ever be able to run again either. The news was took me for a shock as I remember sitting in the room with my mom hearing things I never thought I would hear, especially in my senior year. Something I will always remember is making the phone call to Coach Evans right after the doctor’s visit and telling her the devastating news. This was probably one of the hardest things I’ve ever had to do because it was the first time that I had actually said out loud that I was out for the season and done with my softball career. What made it so hard was that I didn’t know my last game was going to be my last game to actually set foot out on the field. Shortly after calling Coach Evans, my mom traveled back from Houston to College Station and I called a team meeting at my house to let my team know of the news. Led by a strong senior class of 4 players – me, Megan Gibson, Jami Lobpries and Jamie Hinshaw, we vowed that even though I was injured, the team was going to rally and be able to work through anything that came out way. I had one surgery in March and another surgery in June of 2008. I was no longer able to help my team on the field so I decided to focus on helping them from the dugout, especially during games. I really wanted to stay busy and feel a part of every win and every loss that our team had throughout the season, even though I knew there was absolutely no chance I was going to go out there and play. In a way, I became a player/coach. My role ended up changing in my senior season from an every day starter to someone who sat in the dugout and charted pitches, looked over opponents scouting reports and communicated in between innings with our catcher, Erin Glasco, and our pitcher, Megan Gibson. DUring the game I would study the hitters, take notes and help put together a strategy on my ideas of how to pitch to them the next time around. This information would go on a card that Erin Glasco wore on her wrist that I updated every inning. At the time all of this was happening, I just thought of it as a way of staying connected to the team, however I now know that this is when I learned of my true passion for coaching. In my senior season of 2008, we won the regular season Big 12 Championship and the Big12 Tournament Championship. Senior, Megan Gibson, had one of the best seasons in an Aggie uniform in history. We rolled into the post season playing extremely well, winning our Regional, hosted in College Station, and moving on to Super Regionals, again hosted in College Station against Stanford University. 2 wins against the Stanford Cardinal locked in a spot for us in Oklahoma City at the WCWS for the second year in a row. We had a magical run in Oklahoma City in 2008. When I got injured earlier in the season, so many people had counted us out and we proved them all wrong, not only by making it to Oklahoma City, but by making it to the National Championship Series. At the WCWS in 2008, we had wins against Virginia Tech, Louisana-Lafayette and Florida. We faced a very talented Arizona State team in the finals. This was by far the most magical and memorable experience of my life. Being on the Hall of Fame Stadium field in Oklahoma City and being one of only two teams left playing under the lights was breathtaking. It’s hard to find words to explain it. Even though I never took the mound or played 1st base in Oklahoma City this year, it remains by far, one of my most favorite memories of my life. 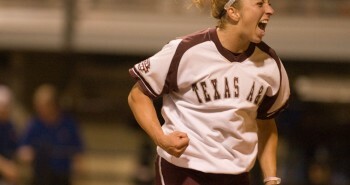 Not too many people can say they competed for a National Championship, but the 2008 Aggie softball team did just that. We fell short to ASU that year and came in as National Runner Up. However, that week and a half in Oklahoma City is something I will never ever forget, and I was so unbelievably proud of every person on the team, as we accomplished something that had not been done in Aggie Softball History since 1988. Texas A&M has a ton of school traditions, as does the softball team. One of those traditions is for the seniors to leave their cleats on the home plate of the last field you play your last game on. For me, Jamie Hinshaw, Jami Lobpries and Megan Gibson, that field was in Oklahoma City at Hall of Fame Stadium. It was an extremely emotional night because we were such a tight-knit class, but we were also extremely proud to drop our cleats on that historic field after a memorable week of games for the Aggie softball program. That moment standing at home plate with my 3 classmates is engrained in my head and is a picture that is continued to be used to this day. At the end of my career at Texas A&M, I found myself in the top 10 in several statistical pitching and hitting categories. At the plate, my career batting average was .355 with a .608 slugging percentage, 125 RBI’s, 42 doubles and 25 homeruns. On the mound, I posted a 1.45 career ERA and 71 wins through 109 appearances. In my 3 years on the mound, I had 27 complete-game shutouts, with 537 strike outs through 599 2/3 innings of work. Academically, I was honored for my success in the classroom as well. I was a three-time Academic All-Big 12 first team selection, a two-time ESPN The Magazine Academic All-District choice and I became the second Aggie softball player ever to be named an Academic All-American my junior year, which I consider a a huge honor and one of my greatest achievements. I graduated in December of 2008 with a Bachelor’s of Arts in Communication and completed my Master’s of Science in Sport Management in 2010. In the 2009-2010 season, I was named the Aggies’ Volunteer Pitching Coach. Even though it held the title of volunteer, I was the full-time pitching coach, assuming responsibility of the pitchers on our team, while still giving individual lessons on the side any time that I could in betweeen the Aggie softball schedule and getting my Masters. After the completion of this season, ESPN asked me to come back and work the studio for Sports Center U in Charlotte, NC for the weekend of the 2010 Super Regionals. After the completion of this season, I decided I wanted to go out on my own and not coach collegiately. I really enjoyed giving lessons and holding clinics and wanted to be able to call more games on ESPN. I had a certain vision in my head of where I wanted my career to go. It’s hard to put exactly what I do for a career into one sentence, because I do so many different things! I am a sports broadcaster, a private pitching coach, co-founded a clothing line, I’m a motivational speaker and I help coach a an 18U Gold tournament team in Houston. This TV career has been a whirlwind! Learning the TV life has been rewarding and challenging; to me it’s like learning a new sport with a new language. My work as a college softball analyst has increased every year since 2010. I had lofy goals in 2010 of hoping one day to do 50 college softball games in a season. Last college softball season, in 2013, I worked around 45 total college softball games. Ironically, what has been the biggest blessing is the creation of Longhorn Network. Longhorn Network covers every single one of Texas softball’s home games and it started in the fall of 2010. In the spring of 2011, the softball season, I got a call and got asked to work games on Longhorn Network. ESPN owns Longhorn Network, and since I had previously worked with ESPN, played in the Big 12 and live in Houston, it seemed like it could be a good fit to do the Texas softball games on LHN. I have worked with Longhorn Network for the past 3 college softball seasons, and have done over 50 games amongst those three seasons. I attribute Longhorn Network to my increasing knowledge and getting comfortable in the booth of softball games on TV. Without the amount of reps that I have received from them, I might not be in the position that I am in today. Like anything, you must practice to get better at it, and the only way to practice being a college softball analyst is to actually get games on TV. Through the past three season, not only have I worked with Longhorn Network, but I continue to do college softball games on the ESPN Family of Networks, as well. The amount of coverage of college softball continues to increase every season, and so has my reps. In 2011, I did about 20-25 televised games. In 2012, I did about 30-35 televised games and this past season in 2013, I did about 40-45 games. The next goal I am taking on is getting into sideline reporting for college football and college basketball. I have worked men’s and women’s college basketball games on the sideline and got to work sideline on my first college football game in November of 2013. Because of my growing television career, it has pulled me from being able to give lessons and give as many clinics. I do still get a chance to go out and work with the youth, but I absolutely LOVE being able to call college softball games and work my way into sideline reporting. I try not to say no to anything that comes my way involving TV, which leads to less days to give lessons and put on clinics across the country. I still absolutely love working with young girls and it has been a challenge to balance a schedule filled with lessons, TV and coaching the Texas Firecrackers Gold, a tournament team in Houston. And as if softball coaching and a TV career wasn’t enough, I have officially started my own clothing line with my best friend, Savana Lloyd, called bellalete. To learn more about why I started this clothing line, click here. I plan in the future to continue giving as many lessons as I can fit in around the Houston area and giving clinics across the country when my TV schedule does not pull me away. My ultimate goal is to get to do as many college softball games as I possibly can in the spring and work as many college basketball games and college football games in the fall. While doing this, Savana and I plan to continue to expand bellalete and touch as many women as we can with an inspiring message. My life up to this point has been so crazy with what all has been thrown at me – the good and the bad alike. Last, but not least, I want to mention some things about me personally. Yes, we softball girls have a life outside the wonderful world of softball! I absolutely love to travel. I want to see the world! I’ve been to lots of different countries and continents including Australia, Thailand and many different countries in Europe. I also love finding time to work out, this way I can feel better about eating desserts since I have a big sweet tooth. I like trying new food; since I get to travel a lot, I am always on the lookout for a solid restaurant in all of the different cities and towns I venture to. I love chocolate and chocolate chip cookies, and well, really any kind of dessert that you put in front of me. I will always be an active, sports loving person. Not only do I like to play them, but I always enjoy watching them in person and on TV. My favorite TV show ever is Friends and I’ve watched every episode at least 5 times. I absolutely love the color pink, it’s my favorite. I always try to find time to be able to spend with my family and my friends, as every month I feel like I travel more and my time at home gets less and less, which effects the time I get to spend with them. I wanted to be sure to write a thank you for the opportunity of meeting you this past Sunday at the Hit Factory in Fishers, IN. You are a great pitcher and teacher. I just wish I could have worked with you even more. Thank you for the positive feedback – I really appreciate it! My dad said he was very impressed with you as well and that we will continue to practice what you taught us. He said the next time you see us, I will give you more 9’s and 10’s like you requested. Have a wonderful weekend! Haha! Hey Chelsea! Thanks for stopping by here! Enjoyed working with you and I am so impressed you took the time as a young lady to come and write on my website, that says a lot about you! Keep in touch, and I hope you continue to push for 9’s and 10’s. You have such a great spirit about you, never lose that! It is an amazing quality to have for more than just softball! Thanks so much, Jim! I enjoy it all! Thanks so much for sharing your journey with us, what an amazing career you have had so far, we love watching college softball and will be excited to see you as a commentator more in the coming years. My daughter was thrilled to get to attend your pitching clinic this weekend she came away from it excited and ready to work hard, thank you for inspiring her! Thank you 🙂 So happy she could come!! If I can help bring excitement and joy to one girl, then I have done my job! Thank you!!! Amanda’ story is one of dedication and hard work, but I don’t think she tells the whole story. As Amanda’ s high school coach, I had the privilege of spending countless hours with her for four year, and yes she was good…very good. However, when she entered high school, she was just 14 years old. She was still growing as a player and a person. It wasn’t always easy, but she always stepped up to the plate and worked her way through all the trials, tribulations, and hardships. Yes, Amanda Scarborough made mistakes, but she always learned from those mistakes. They were not made twice. I think my fondest memories of Amanda was not just her softball abilities but her leadership skills. She ALWAYS put the team first. It would have been easy for her to fall into the role of a prima doña, but this was not the case.She chose to be a team player..a leader..always giving credit to her teammates and her school. She worked hard and led her team. She was always ready to play AND practice. No moaning, no frowning…..she inspired others to be better. There is no better definition of a leader. And when practice was over, she went home and practiced some more. I cannot end this without reflecting on her wit and humor. She made me laugh! And she laughed…even when a bird flew over and hit her with his dropping. She handled it all with grace and humor. What better gift can one person give to another? So when I think of Amanda Scarborough, I think of the young girl who grew into a confident woman, a woman not afraid to be her own person, a woman willing to work hard to achieve her goals…..a leader for other young girls and women. Wow thank you so much Coach B!!!!!! I am just now seeing this and it is December 10. Brought a tear to my eye, I love you! Great bio and website. Always enjoy the work you do to build up and be such a good ambassador for the sport of softball. I enjoy the work you do with calling games on TV but really enjoy the blogs and work you do to build up the young girls. To me you are teaching much more than softball. I got in to coaching to teach kids how to win. Winning in sports and life is about putting in work in the small things that others overlook. Thanks again for taking the time to represent the sport so well. Amanda, thanks for all of the insight into softball and girls! I am a dad and coach of a 12u and 14u girls, and I made the switch from 15 years of coaching hs baseball to travel softball…I love it! I have soooo much more to learn, especially about how to motivate a girl to be successful. I am average at it. My Ohio team went to the Little League World Series in 2014 (finished 4th) and I cant think that if I was better at my job handling girls they could’ve done more. I wish I had discovered you sooner, but glad I found your website now and look forward to the future readings and advice you give me and my daughters to help us be as good as we can. Continued success to you, but don’t forget that the biggest contributions you may make in this sport, you may never hear about. So keep up the great work! I (we) need people like you! Your stories are so uplifting and I am enjoying showing them to my 14 yr old pitcher. She is as well enjoying reading them. Who were your pitching coaches? Middle school and High school? Did you return to them for refreshers during college breaks? Yes. Jill coached Grace for two years. She also goes by Reishel. We miss her so much. I just figured that we would be able to find a pitching coach in Houston but haven’t found anyone as good as her. I have tried to get in touch with her as I would give anything for Grace to go back. I haven’t heard from her though. I thought I read somewhere that your pitching coach was Bobby Smith. Hmmm…I don’t know why I thought that now. Just in case we don’t hear back from Jill, do you have any ideas for Grace? Thanks so much. I am going to get Grace some of your pants and a T-shirt for her birthday. Hi my name is Kaitlynn Anderson and I was born on April 20, 2004. I love all the drills you show on the internet. I have also been pitching for 3 years. SOFTBALL is my life. I wouldn’t know what to do if SOFTBALL never was created. My goal and my dream is to pitch at Oklahoma University. THANK YOU!!!! I have a question do you still play with TEXAS because my cousins live in Frisco Texas. No, I am old now! I live in Houston and I commentate games on TV, no more playing for me! When are you going to be in kansas. I would love bto go to one of your softball camp..
not really sure at the moment! Do you miss playing softball….. I was fumbling on facebook and came across your blog! It’s great to see girls (ladies) that we grew up playing with doing so well 🙂 Congrats on everything! Keep on rocking life! Hello, Amanda..We need some advice. Our daughter is a pitcher and utility player for a ASA Tennessee team that plays A ball and finished last summer ranked 3rd in the nation. My question is about High school ball. The school team has 5 pitchers, but only 2 see the mound. These two take lessons with the high school coach. His track record is he only puts his pitchers on the mound. Ok…he’s the coach..but high school softball consumes all evenings and wkends, so my daughter is not able to have any pitching practice. He doesn’t even let the other pitchers warm up. We have a batting cage at our house. That’s how commented she is. 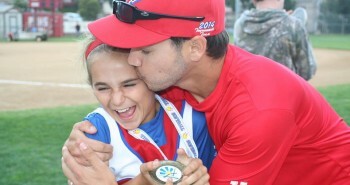 She strarted lessons at age 7 and has worked very hard to earn a place on her select team. We are now playing showcases, with the hope to play college ball. Would it be a bad decision to not play school ball and continue practicing her pitching during that time so she is on her game come summer select? Or even play for a another team in Georgia during that time, they play high school ball in the fall, so their select teams are playing during Tn high school ball. We just need some professional advice. We don’t want to do anything to prevent her from reaching her dreams! Everyone will make another decision about this. I, myself, like highs school ball because of the similarities it has to college ball and the DIFFERENT things you can learn – school and time management, balancing school AND social life with a team, practicing every day after school, playing a long season instead of one tournament, playing local girls from your area, competing for championships and then playing in a post season. In MY area, there are no 16u and 18u tournaments going on during the spring because everyone is playing HS ball. I cannot make the decision for you, but remember there are other valuable lessons she could be learning other than playing time vs no playing time. And I’m not sure how old those other pitchers are, maybe they are juniors and seniors and you daughter is a fresh and she will eventually earn pitching time later down the road? I’m only 13 years old and you have been my favorite college pitcher for 6 years now I live in California and I am a pitcher in major league fastpitch softball. I watch every video of yours on pitching and batting. This year I hope to hit my first home run!i have worked so hard at school and at softball so that I can go to Texas a&am just like you did so I can be a pitcher! Thanks Allison! Work as hard as you possibly can and always keep your dreams in the back of your mind! Awesome! Keep working hard year round!!! You are my favorite person to watch when it comes to pitching. I have a question for you. I have been pitching for about 6 years now. Here recently I started side arming when I pitch. I don’t know where it came from honestly. But my question to you is how can I go about fixing it. need to break down your release and work on touching your release with the inside part of your arm and the side of your hip every time! Your story is amazing!! You traveled an hour to get to your softball home field when you were young. You succeeded in school. You have had reconstruction surgery on both feet. Now you are a pitching coach and many more things!! You have inspired me to work hard at my pitching! Thank You! I’m a left-handed pitcher who has been taking pitching privates for two years now. I’m struggling all of a sudden with “crow-hopping” or not dragging my toe. Do you have any suggestions or drills to help? Stop the habit NOW! Do a lot of reps without a ball and focus on just having good mechanics before that habit gets even worse! Great story! We miss Texas as we lived in The Woodlands during the 90’s. Our oldest was born in The Woodlands. Our softball pitcher, the 13-year would love to go to Texas A&M, maybe it will happen, but hey don’t take many out of staters. She makes straight A’s and is pitching at a high level, so never know what might happen. Gotta keep doing work! In fact, we drove four hours round trip last night for her first pitching session with a new pitching coach. Her (pitching coach) name is Taryne and guessing you probably know her! LOL Take care. Tell Taryne hi! Good luck. I can’t even begin to thank you for all that you do! I’ve been watching your videos on pitching (hitting as well) since mid April, putting many hours into my pitching, and I’ve improved SO much! Not only has your videos improved my pitching, but my overall presence on the field! Even now, I’m able to tell why things go right or wrong, and how to fix it on my own, because unlike why I’ve experienced before, your teachings make sense. Everything that you do has a purpose that goes to the main result. This is very important to me because I learn to pitch with my mind, a.k.a., if something doesn’t make sense logically, it frustrates me a little, lol! The thing that I love the most is that now I can be there when my team needs me, whether it’s to be a confident leader, to give a few pointers, to throw a strike, and most importantly: to show that anything is possible with hard work and dedication, that you can do anything you set your mind to anywhere in life. I love being there for my team and learning to be a leader each day, and I can’t thank you enough! I am 15 years old, and in about two weeks my team has its first travel game EVER, which I still will be working each day to improve myself for my team and I. I hope to someday be a coach, in which I want to teach my pitchers to use your mindset in pitching: to use everything they have towards their pitch, and to have confidence on and off the field ( which goes for all players of course ). I do have one question about my pitching: I am 5 foot 8, and my legs make up 3 feet of that but my stride I only about 5 feet, should it be longer and how? SARAH! Thank you for this so much!!! How sweet you are!!! I love how you described how I teach – that’s what I want to be known for! Presence is SO important, keep working on it always! Keep working each and every day and GOOD LUCK in your first ever travel game, how exciting! Take it all in and remember to breathe!! As for your stride – your MAX stride should be 7 of your own feet….measure it that way….. Thank you for all the helpful information that you provide. Can you tell me where I can find all of the drills that a 8 year old who wants to pitch should start out with? No true list, but go ahead and youtube my name and there are some beginner drills there! Me and my girls in The Packaged Deal have an app coming out this summer, too! Research it on your own!! I am definitely here to help, but I think the best thing you can do is learn some on your own and hop on to watch some videos to see what you feel like you need to work on, tell me what you learned, and then I am more than happy to add to the knowledge you learned on your own! Show me what ya got! My childhood was like yours. Softball ALL the time. I loved every minute of it. I was also a pitcher and had to work hard to earn all of my high school and travel ball achievements. My senior year, I had scholarships to go and play, BUT God had a different plan and I was gifted with a little girl in May of 2013. I was overwhelmed with joy and heartbroken at the same time. My love for softball hasn’t and will never die, but now I give little girls in my community pitching lessons. I absolutely love every minute of it. I get to see the love I had for the game in all of their eyes and teach them so much. I use a lot of the drills you have posted videos of and tell all of my girls to go to your website and read read read!! Thank you for being so inspirational and giving awesome examples!! Thank you for all that you have done for the game of softball. I am a 14 year old pitcher that loves the game and I will do ANYTHING to get to the next level. My dream is to go to Stanford on a softball scholarship and study human genetics. I love the game and the strategy involved in the game itself. Pitching has been my love since I was about six or seven years old. Recently, my elbow started to hurt when I throw any type of pitch, especially the curveball. We just had tryouts about 3 days ago and one of them was 3 hours long. I pitched and threw overhand repetitively, because I play third base when I’m not pitching. I made the Effingham Flame 14U Fastpitch Softball team this year and I am really looking forward to our practices and games. My question is to you: have you had anything like that ever happen to your elbow and, if so, do you have any advice to give me? None of the medical websites/symptom checkers are helping me in the very slightest. I think the best thing you can do is check your mechanics! If you are throwing overhand with proper mechanics and your curve ball with proper mechanics, your body should not be in pain! May be important to break down your mechanics before you get too much older and then you are in too much pain to play! Thank you so much, Lakein!!! GOOD LUCK! I hope to keep inspiring you!! Hey Amanda! Greetings from Malaysia! ???? Thanks for sharing ur journey. It inspires me a lot! I hope someday I can be like you. Ur achievements are what inspires me a lot. Hope you can upload more videos about softball drills and perhaps upload videos on softball fitness on Youtube. That’s sure will help me more on improving my skills ⚾ Thanks Amanda, it all starts with big dreams ????. Hello Nur!!! So awesome you have found me all the way from Malaysia! Thank you for following! I hope you follow me on Facebook, I put a lot of videos on there, http://www.facebook.com/amanda9scarborough and also with the group of girls I do clinics with called The Packaged Deal, http://www.facebook.com/thepackageddeal! GO to both of those pages and we put a lot of information. If you have an iPhone, you can always access our app called My packaged Deal. http://www.appstore.com/mypackageddeal. Wishing you the best of luck and you are totally right, it all starts with big dreams!! GOOD LUCK!!!! I am a nine year old pitcher and I LOVE YOU!!! I think you’re an amazing pitcher and softball player in general.I have a goal in life and that is I want to go to ATM and win the World Series. I think pitching is awsome and wanting to continue on learning my pitches and develop not only strength, but mental strength. You don’t know how bad I want to meet you!!!!!! You have me in wow! I loved your Bio and it’s impressive how you never gave up! My daughter is 14 yrs old and loves softball with a passion! She didn’t start playing until she was 9, but she fell in love with the game right away. Ever since then, she’s been in select teams and school softball as well. Her dream is to play college ball … she’s pushing herself to keep her GPA up so that she can get into a good college and play at the college level. She’s a catcher, outfielder, short-stop, 2nd base … she plays anywhere they put her but her favorite is catcher! She demonstrates a lot of determination and leadership skills and I support her love for the game and even though at times it can get pricey (being a single parent of 3 and all) I believe it is all worth it in the end! No matter how hot/cold it is she puts all her effort all the time. She really amazes me with her dedication! She is our primary catcher and first batter in all games … there was this one time she was catching 8 games all day tourney and she still wanted to keep going. Reading your story really inspired me and I believe that my daughter has a shot if she just keeps going and pushing to accomplish her dreams! Being from a small town in South Texas, where it’s always about favoritism and “who you know” … it’s tough to keep positive at times, but we have to keep positive. I know that my daughter has gotten to where she’s at on her own talent with no strings pulled because I believe she is talented. We just got to keep our heads up and striving forward. Thanks for the motivation! Learned about u through a friend who coaches my daughter and told me to watch your videos to help my 9 year old.You are great at what you do.i read your story and was amazed at your accomplishments and heartbroken about your injury but that didn’t stop you from becoming a powerhouse in sports,ESPN,and fashion.Continued success and hope to 1 day have my daughter attend 1 of your camps.Keep up the great work and thank you. What a sweet message – that you SO much Raul. I really appreciate this. What a sweet message – thank you SO much Raul. I really appreciate this. Hello Amanda. My daughter is 5 1/2 and has been playing in Cypress Tx. since the age of 3. She started playing Blastball which is a very simple version of softball. She enjoys playing the game and we’ve been told she has very good mechanics for her age. She recently started showing an interest in pitching. She tries to imitate college players we see on you tube together. How young is too young to start teaching her to pitch? Would it be a waste of time at this age or an advantage because she is so young? Thank you for your time and have a great day! I can honestly say I have NEVER heard of Blastball!! Wow…. I would say start at earliest at 7.5 or on….8/9 is usually a more normal age to attempt. But if she just can’t get enough of it and she is constantly imitating and wanting to do it, then late 7’s might work! Amanda, My daughter Katy Adair went to Magnolia High School and Graduated in 2010. Katy was a High School Pitcher and started pitching lessons at the age of 5 years old with Ken Hazelwood. The most I can remember is Katy always had to be at all your High School games. Katy never missed watching you play. Katy was so inspired by you that she started working hard to be like you. I can now say I am so proud of Katy and she got a full ride scholarship in softball and now assistance coach at Sam Houston State University softball. Thank you Amanda for inspiring my daughter Katy Adair as she grew up to be a talented young lady. ~ WHOOP~ YOUR AMAZING…. WE LOVE YOU! Awww what a great story!!! I say Katy whenever they played A&M back in February I believe! I didn’t know this about her! SO COOL. Thanks for all of the valuable information on your blog. What a great message and inspiration to young girls. I hope my three daughters will see the dedication in your words and become inspired to work hard. I am looking forward to hearing your advice for a new coach, (sent you an email). Also, any advice for teaching left handed pitchers? Is it much different mechanically, or should we just follow the same mechanics? Same mechanics! Just have to twist it around! It was truly a pleasure to be able to read about your life, it’s trials, and your successes. I will be the first to confess that I am a softball idiot. Having had a stroke at age 4, I was never able to play baseball. However, this is my 9 year old daughter’s first year of softball (playing in 10U). She is incredibly excited, and we had spent the last six months learning (and working on) the basics. She shared with me that at her practice today, she was the only person who hit the ball (hitting it three times) and abstaining from swinging at those pitches that were meant for her to miss. Though I was only able to hear about it from her (I am in the military and currently in “the field”), a swelled with pride. I am sure that there are many role models out there, but I am truly impressed with your drive. When I return home, I am going to introduce my daughter to you (through your YouTube videos) and tell her your story. As I know role models are not prescribed, but rather chosen by the individual, my daughter will undoubtedly look up to you. Perhaps one day she would even be able to meet you. Thanks for listening to a father brag on his daughter in a public forum. Hi Dustin 🙂 Best of luck to you, your softball journey is just beginning! Cherish every single tournament and every single game, and all the practices you get to spend with your daughter! Let me know if you ever have any questions! Thanks for helping keep us safe! My daughter and I live in NC, in an area with little exposure or opportunity. She is currently an 8th grader headed to high school next year. The high school has a stable if pitchers. Do you suggest that she hang in there and hope for an opportunity to pitch or focus more on travel ball? Why can’t she do both? If she loves to pitch she needs to learn to compete for a position and take advantage of her opportunities. It’s a different role, one that she will need to know how to work with in college! Hey Amanda I’m Abby and when I was little I pitched.My first game everybody yelled and made me cry.Now I am a great pitcher and I throw a lot of strikes. Hi Amanda. My name’s Amanda and I am thirteen and have been playing travel ball and pitching since I was 8. I started playing for a travel team two years ago and when I again tried out this year, they told me I would be number two pitcher. Well another girl started pitching and had a lot of speed, so I was moved down to third. In the past four or five tournaments we have been in, I have only pitched once or twice. My coach told me last tournament that it is because I don’t have enough speed. I’m trying out for a new team this year, but my spirits have been brought down so I am trying to increase my speed. I was wondering if you had any tips I could use for this. Thank you. Hi Amanda! Make sure you are following my Facebook page, I give lots of drills to increase speed all the time! http://www.facebook.com/amanda9scarborough Keep working hard, dont’ let it get you down. Instead of getting down, work harder! Hi! Unfortunately I do not do private lessons anymore and at our Packaged Deal clinics, pitchers who come do need to have some experience pitching to get the most out of it!!! On my Facebook page and on Packaged Deal Facebook page there are TONS of videos you can learn from that can help get you started! Hello! My name is Angelina Pepe. I am going to be writing a letter to you in my ELA writing class. I will tell you everything about why I am writing to you but, for now to mail the letter to you i need your PO box information or, fan mail. I could not find anything on the internet. Anyway you can help me out? Such an inspiration. Keep striving forward, it’s the best feeling. I pushed for my moto-cross, & football through my high school only to find out after making a great play that my right knee was destroyed, after 3 sutgeries I got my letter in Volleyball. Now 50 I look back at that on the plus side. I became one of the top welders in the state of New York. I to went for more teaching, learning all I could in my skilled trade. Throughout my career of welding/fabrication made me able to teach ones I worked with to better their quality of welding. I started following fastpitch after my friends daughter practiced pitching to us guys. Holy cow that ball is moving. She followed your career, & to watch her grow in the sport just from watching you & the others in this sport is beyond words to explain. Keep building the spirit within the young. Reading this brought a tear. Maybe see ya in Venice, Fl. Thank you have showed me that my dreams may be big but they are able to be done !!! My name is Sam and I love to pitch. You are my idol! I watch everyone of your videos and even practice while watching. You are my inspiration. Keep Working Hard! Hi Amanda…..my granddaughter, Danielle, started pitching around August 2016 and she is 10 years old…..at the time nobody thought she was good enough to play on a travel team…..in January, her pitching couch sent out a video of her pitching and was immediately picked up on a team…..in March 2017 she pitched her first game, not having pitched in a game before….she pitched three innings, walked two and struck out 9….the coach gave her the game ball…the summer she pitched 158 innings with 152 strikeouts, and 2 no hitters….her ERA was 4.297, whip was 1.797…she was throwing the ball at the beginning 42 mph….at the end she was throwing 44-46 mph…..the fall league she pitched 67.2 innings, 103 strikeouts, 19 walks…2.837 era, 1.507 whip…2 no hitters……speed is consistently 47 mph with sometimes reaching 48….her changeup is 38 mph….her dropball drops 8 to 12 inches right at the plate….we have coaches from the other teams telling her how good she is and even the umpires say something to her….it’s scary to us…..we were just wondering if there is any advice you could offer us because we are overwhelmed with her performance….and very proud…..thank you….. I went to the Packaged Deal and found out you weren’t there, I was so sad but I had fun with Jen Schroeder, I would love if you would post more videos on how to pitch. Hey Morghan! Make sure you are following me on Facebook or one of your parents!! http://www.facebook.com/amanda9scarborough for lots of pitching videos! oh and sorry I wasn’t there!! February – June I can’t be there 🙁 Glad you met Jen and had fun with her though!! Can’t wait to see you next time!